Peg and I and a friend visited the new restaurant Red Wagon - Burgers & Philly Cheese Steak. It's in the same location that Fusion Bento was in for years close to GameStop and Big Lots on North Pearl. My friend, Donna and I met Peg there at Red Wagon. Peg had beem there several minutes. Donna and I sat down and we all three began talking. After a while I saw people lining up at the counter. At Fusion Bento orders were taking at your table. Donna got in line. I asked what Peg wanted and then joined Donna. Ordering at the counter is so fast-foody, so why the tip jar on the counter? Peg and I usually leave a 20% tip, but I don't tip at MacDonald's and I don't like tipping before I even get my food. I ordered fried oysters, which came with fries. 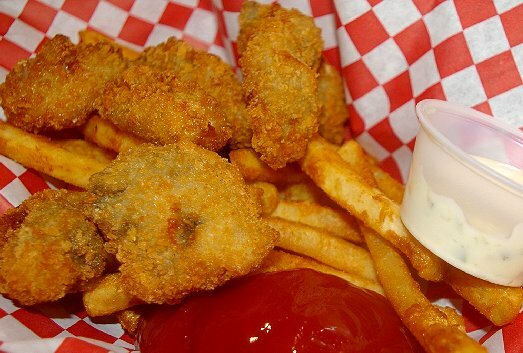 Oysters are not something you generally find in fast-food places. Peg's mushroom burger would have come with provelone cheese, but we ordered it with Cheddar instead. I should have ordered the burger medium rare, but in the fast-food mentality, I forgot. Even MacDonald's even allows special instructions on their premium burgers. My oysters were well-coated and deep fried, which gave a hard shell. There was no compairison with the fried oysters I had ordered at the Galway Bay restaurant in Ocean Shores a little over a week earlier. I ate them all, but will probably not order them, again. Donna was served her mushroom burger several minutes after my oysters made it to out table. Peg's mushroom burger was delivered over five minutes later. We thought they had forgotten the order, but no they said it was still cooking. Peg and Donna both said their burgers were "okay." I picked at my fries (coated with something) and watched with interest as Donna and Peg worked on their burgers. Peg offered me half her burger, but I declined. As the meal progressed I was sorry that I had turned it down. The mushroom burger sure looked good, and I imagined it cooked medium-rare . . . and juicy. Red Wagon burgers are 1/3 of a pound each. You can order the burgers by themselves ($5.50 to $8.99) or pay an extra $3.29 for fries and a medium soda. I love the tri-fold menu, which easily stores in your hip pocket and can be left in your glove comparment. I would be a player for the BBQ Pulled Pork ($5.99) and a house salad ($4.79). Healthy wraps are all listed at $7.95 as is the Chicken Caesar. I hope the Red Wagon makes it. 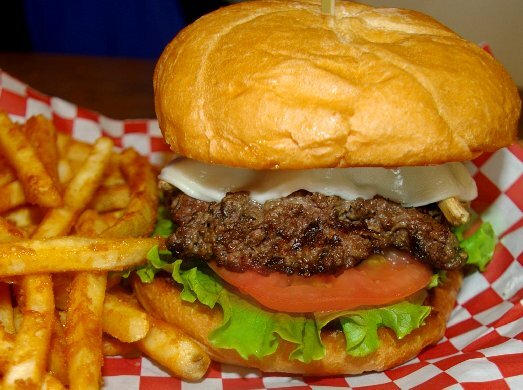 I think there is room for a lunch and dinner burger place on North Pearl. 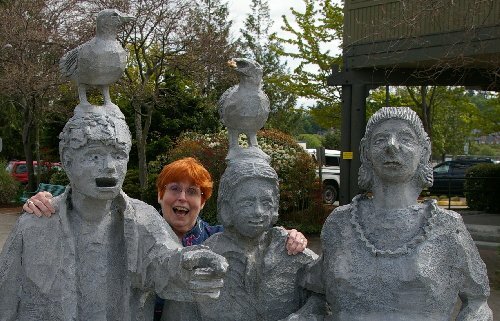 We enjoy meeting people and we expect to have a wonderful time when we travel. Our expectations are almost always met. If you have a favorite restaurant or a favorite hotel, where they offer exceptional service, please, share your favorites with us. Or if you have a B&B, hotel, or restaurant that you would like us to try and then include in our stories tell about what you have. No matter what, please share your thoughts. 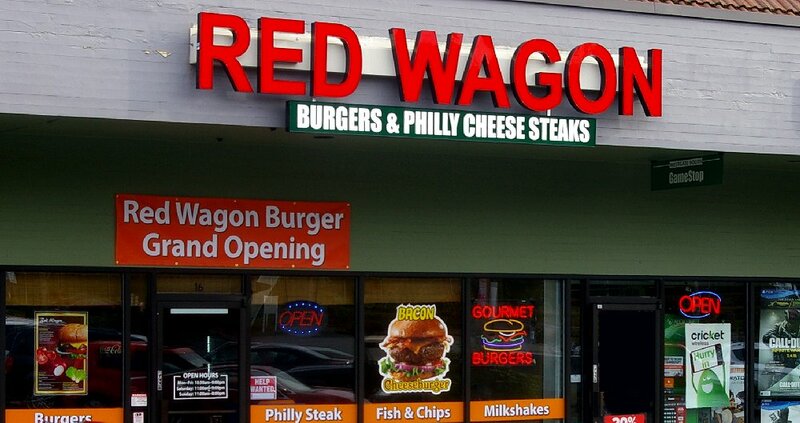 Red Wagon Burgers & Philly Cheese Steak - 2016 Tacoma, Red Wagon Review Tacoma, gourmet hamburgers tacoma, delux hamburgers tacoma, Red Wagon Burgers & Philly Cheese Steak - 2016 Tacoma Washington WA.